Music Director Lara Webber has conducted LAS concerts at school assemblies in Livermore and Pleasanton elementary schools since 2015. 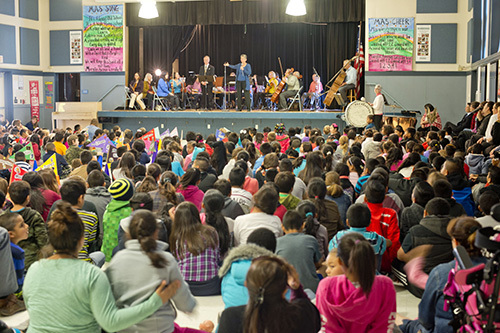 In April this year, LAS will present concerts at Dougherty and Frederiksen Elementary Schools in Dublin and at Hearst and Mohr Elementary Schools in Pleasanton. 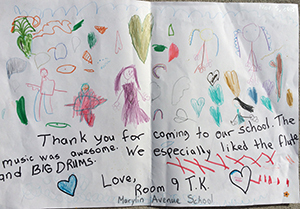 In 2018, more than twenty-five orchestra members volunteered at performances at Donlon and Fairlands Elementary Schools in Pleasanton on April 19 and Leo R. Croce and Altamont Creek Elementary Schools in Livermore on May 3, reaching a total of approximately 2,000 students. 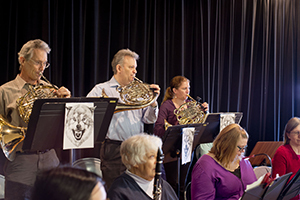 As in 2017, actor Michael Wayne Rice of the Livermore Shakespeare Festival narrated Sergei Prokofiev’s classic work “Peter and the Wolf,” followed by questions and student responses led by Music Director Lara Webber. The six outreach concerts were made possible by several grants. These concerts were made possible not only by the mostly volunteer LAS musicians plus members of the LAS Association board — especially the LAS youth outreach committee — and Symphony Guild, but also by grants from the Pleasanton Arts Commission and the Pleasanton Youth Commission with administrative help and support from the Livermore Valley Performing Arts Center / Bankhead Theater. On November 5, 2015, Livermore-Amador Symphony Music Director Lara Webber conducted roughly 25 LAS musicians led by concertmaster Kristina Anderson at three Livermore elementary school assemblies. A highlight of the programs was the performance of Prokofiev’s “Peter and the Wolf,” narrated by Livermore Mayor John Marchand. A total of more than a thousand students attended the assemblies at Arroyo Seco, Jackson Avenue, and Marylin Avenue Elementary Schools. 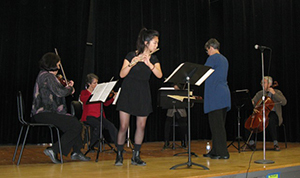 See “Livermore-Amador Symphony Shares the Joy of Music,” an article by Patricia Boyle published in the 11/12/15 edition of the Independent, and see “Livermore elementary kids treated to orchestral delight,” an article by Beth Jensen published in the 2015 Thanksgiving Day edition of the Contra Costa Times. 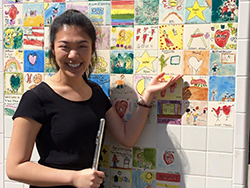 Three school assemblies in March 2015, for 4th and 5th grade classes at Junction and Joe Michell schools in Livermore and 5th grade band students at Vintage Hills Elementary in Pleasanton, featured phenomenal flute player and April 2015 LAS soloist Annie Wu. A string quartet of LAS players accompanied Wu: Juliana Zolynas, Ursula Goldstein, Judy Beck, and Jim Aiken. Lara Webber conducted and served as MC. Beth Wilson had arranged for the programs. she made in 2nd grade. The musicians played selections from Devienne’s Concerto No. 7 in E minor, the instantly recognized “Twinkle, Twinkle, Little Star” theme as arranged by Mozart, and Prokofiev’s “Peter and the Wolf.” Wu also performed two short solos: Debussy’s “Syrinx” and a modern work by Greg Pattillo, “Three Beats for Beatbox Flute.” (See Wu’s YouTube channel for videos of several of her performances, including the beatbox number). The students were engaged throughout each assembly, but it was “Beatbox” that prompted the most attention. Wu obviously enjoyed playing for and interacting with the kids. Webber did a masterful job of involving the students—eager kids at each assembly raised their hands to share their knowledge and ask questions.